Whether we are going for the vacation or tracking or various all other activities, selecting the right backpacks for this work is really essential. Now there are HoverGlide which are the world’s first floating backpacks by the start up company Lightning Packs. It features a double frame and pulley system which is combined with the bungee cords. These floating bags are taking the load off your body with each step you take. 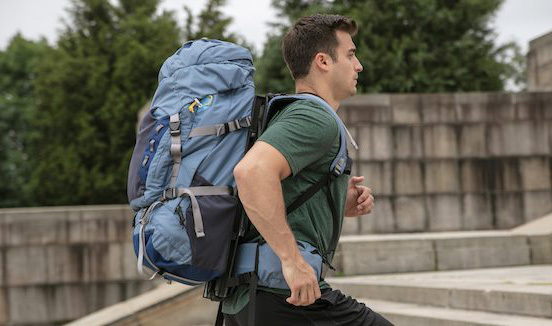 This ultra efficient ergonomic backpack can carry the load for us. They are sufficiently reducing the stress of the weight on our back, neck and knees and ankles as we walk or run. HoverGlide keeps our belongings suspended so that we do not feel their weight and through this, we can carry heavier loads without being slowed down or risking injury. HoverGlide backpacks are really ideal travel companion for our back, neck and knees. Through its double frame and pulley systems, it is able to suspend the load from the frae itself. When we walk or run, it easily glides up and down along this system. It is quiet cool to see the person move while the backpack basically stays in place. HoverGlide is really helpful in reducing the vertical movements and that’s why there is a vertical force on our body. In addition to this, it also reduces the energetic cost of walking with the pack. It means now we can carry the larger loads at the time of moving quickly and also reduces the risk of injury from the too much stain on our back and neck etc. People have been using bicycle from many years as they are a good choice for maintaining health and efficient and easy way of exercise. It is the first choice by the environmentally conscious people as it provides excellent physical benefits and emits no harmful fumes. But the development rate of bicycle lanes is extremely low due to which they are being illegally parked everywhere in the cities and creating eyesores as there are no bicycle parking areas due to lack of space and the high cost of land. But this problem has been eliminated by developing an earthquake resistant underground bike parking system which is resolving all these issues and approaching the situation through their design concept. This is designed by the Giken, a Japanese firm which is based on culture above ground and function underground. This parking system is known as “Eco Cycle” and is engineered as individual cylindrical shaped structure which is measuring 8.5m x 11.6m below the street surface. It is equipped with a mechanically operated carrier lifts which organises the bikes into any of the 204 stalls. This design focuses on staggered arrangement with loading pallets which can maximize the amount of storage with the minimal spatial footprints. Its operation is easy due to IC tag which is mounted on the front wheel and corresponds to the user’s membership card. All a user can do is load the bike onto the bay and press start. There is a carrier lift inside it which holds the bicycle rotates downwards and place the vehicle into the open rack. For getting the bike out, just swipe the IC cards and the automated system will retrieve the bike and place it above ground in about 8 seconds. In order to perform deep cleaning and peeling away rust embedded on to the metal, MTR-01 is developed by the team of researchers. The concept of laser cleaning is an important process in terms of removal of contaminants from the surface layer of materials. These contaminants can be in form of carbon, rubber or silicon which could lead multiple damages but the other damages which materials suffer is rust which not only deteriorates the aesthetics of the material but also can be harmful for the quality of the product. This is the reason that the process of rust removal is so important. Through the invention of this technology, the inconvenience if using grinding and blasting, thermal, chemical and thermo-chemical methods can be avoided along with higher running costs, more noise and dust and inability to attain accurately deep clean. Its impressive range of products is available which means that cleaning can be done in the number of different places by accommodating work demands. This laser cleaning uses electricity without any of damaging the base materials and there is no chemical waste produced. It is sounding like some sort of magic but this is a high beam cleaning rust off metal in seconds. Unlike many other traditional methods of rust removal, it looks like it takes absolutely no efforts. It is a groundbreaking technique in removing rust by using a short pulsed laser beam in comparison to the small bullets of light by shooting at frequency. 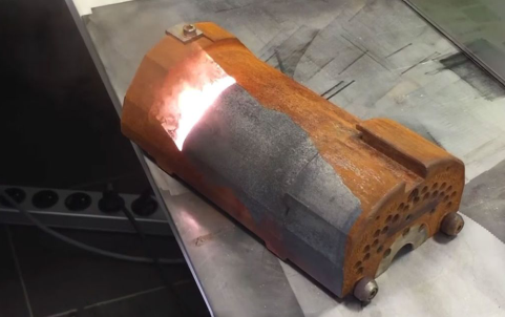 It works due to heating of rust by creating plasma around the working area when base material stays cold. There are a dozens of mechanical keyboards are available in market most of them which are designed for gamers and they are bulky and mediocre. We have to compromise with the beauty also in order to get functionality. 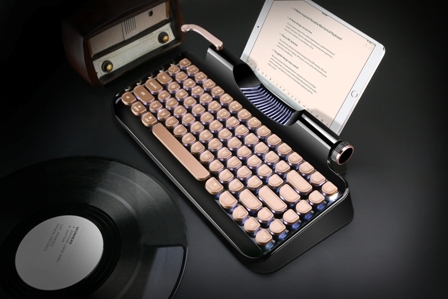 But now there are Rymek Retro mechanical Keyboards which are bringing the charm of vintage typewriter and designed to a modern mechanical keyboard. They are the perfect blend of modern and class and it also has a dual Bluetooth and USB mode in order to support all OS. These keyboards are inspired by the mechanical keyboards and vintage keyboards and they are the perfect desktop companion for the writers, designers and any that person who wants to have a more satisfying typing experience. They have the capacity to work well relatively on a number of other devices. Rymek is inspired from typewriters in the very earlier ages as they are also giving you that clicking experience under our fingers as we type. Classic Design: These keyboards have innovative designs of the keycaps and they are perfect combination of modern and classic. They are designed for productivity and ergonomics. We can type effortlessly and with style. High Responsive Switches: It is all about the switches as they take advantage of mechanical switches which are sturdy and highly responsive. Its crisp tactile sound makes us love about its typing again and again. Design thoughtfully with Easy Control: Not all the mechanical keyboards come with a separate volume and backlight control but these keyboards can be easily switched between the Bluetooth and wired modes with its handle. We can also adjust the volume and backlight brightness with the wheel control. Watching the world’s seas is progressively a mission allocated to self-ruling submerged vehicles (AUVs) — marine robots that are intended to float, drive, or coast through the sea with no ongoing contribution from human administrators. Basic inquiries that AUVs can answer are the place, when, and what to test for the most enlightening information, and how to ideally achieve examining areas. MIT engineers have now created frameworks of numerical conditions that estimate the most enlightening information to gather for a given watching mission, and the most ideal approach to achieve the testing locales. With their technique, the scientists can foresee how much one variable, for example, the speed of sea streams at a specific area, uncovers data about some other variable, for example, the temperature at some other area — an amount called “shared data.” If the level of common data between two factors is high, an AUV can be modified to go to specific areas to quantify one variable, to pick up data about the other. The group utilized their conditions and a sea demonstrate they created, called Multidisciplinary Simulation, Estimation, and Assimilation Systems (MSEAS), in ocean examinations to effectively conjecture fields of common data and guide real AUVs. 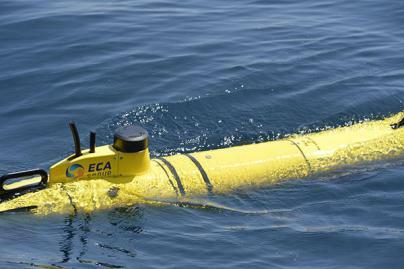 To decide how to securely and proficiently achieve perfect inspecting goals, the specialists built up an approach to enable AUVs to utilize the unverifiable sea’s movement, by determining out a “reachability front” — a dynamic three-dimensional district of the sea that an AUV would be ensured to reach inside a specific time, given the AUV’s capacity limitations and the sea’s streams. The group’s technique empowers a vehicle to surf streams that would convey it closer to its goal, and keep away from those that would throw it off track. At the point when the analysts contrasted their reachability conjectures and the courses of genuine AUVs watching an area of the Arabian Sea, they discovered their expectations coordinated where the vehicles could explore, over significant lots of time. At last, the group’s techniques should enable vehicles to investigate the sea in a clever, vitality productive way. Worldwide, some 850 million people lack access to clean drinking water. Contaminated water transmits a huge variety of diseases, including cholera, dysentery and typhoid, causing more than half a million deaths a year. Researchers developed a solar water purifier they hope can sanitize water more quickly, cheaply and effectively than other models. The design looks more or less like a small A-frame tent. 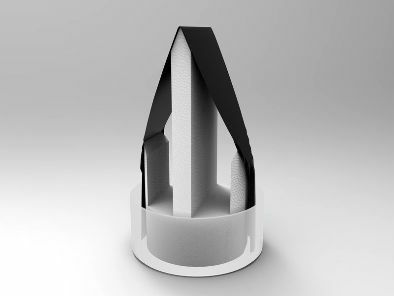 Black carbon-dipped paper is draped over a triangular form and set on top of the water. The edges of the paper trail in the water, soaking it up like a sponge. It’s a modernization of the ancient technology of the solar still, which uses solar energy to evaporate water and leave contaminants behind. The water vapor then cools, condenses and can be collected. Gan’s team improved the design of the solar still, making it more efficient by giving it a sloped shape—this keeps the paper cool, since light hits it at a slant instead of directly. Since the paper stays below the ambient temperature, it draws heat from its surroundings, which makes up for the loss of solar energy during the vaporization process. The device can evaporate about 2.2 liters of water per hour for every square meter of paper hit by the sun. This is more efficient than other solar-powered water purifiers, reseracher says. Researcher and his colleagues have set up a company to commercialize the technology. Their prototype can condense and collect between 10 and 20 liters every day in full sun conditions. As the average adult woman needs about 2.7 liters of fluid per day and the average man needs about 3.7, some 80 percent of which comes from drinks, the still could in theory provide enough daily drinking water for a family. The estimates will cost about $200 and will be available within a year or so. Lead engineer hopes the device will be cheaper than similar technologies developed in recent years, many of which rely on expensive nanomaterials. Scientists have created a tiny water filter using “nanoflakes” of molybdenum, several companies have been looking at using nanocellulose for water treatment. In contrast, the solar still uses inexpensive and widely available carbon paper. The device can be used on any kind of water surface—a lake, a pond, a trough, even the ocean. But how it works will depend on the setting. For example, if the still is used on the ocean, salt will eventually accumulate on the surface. This and other design challenges are still being worked on. The still can remove nearly 100 percent of bacteria, viruses and organic compounds like arsenic, Gan says. It does less well with certain volatile chemicals, including certain pesticides, which are evaporated up with the water rather than left behind. “It looks like it has some serious promise to it,” says Desmond Lawler, an engineering professor at the University of Texas at Austin, of the system. Lawler says one major consideration will be the humidity of the environment where the still is used. In very humid conditions—think the Caribbean after a hurricane—it’s much harder to evaporate water. The team will need to take this into consideration when designing systems for specific locations. Though he doesn’t imagine the system being a substitute for more permanent clean water sources, Lawyer says he finds the simplicity of the system promising. Now you have a readymade room whenever you are going, whenever you get there as there is hitch Hotel which is a simplified and effective version of the camper. It is a comfortable and secured anytime, anywhere hotel room. It is completely wheel free camper which can be attached to a Class 3 hitch on any car or truck. Now there is no need of reservations or tents, just drive, adventure and slide out and sleep. It doubles as a storage unit at the time of transport while closed and stores in as little as 0.9 m of space. They are wheel free and completely suspended off the ground. 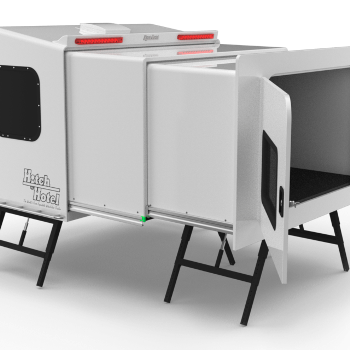 It is designed in order to give you a safe and streamlined place to call home wherever you are as well as its closed position; it provides over 60 cubic feet of secured, suspended and water resistance space for all our gear like bikes along with coolers, bags and sporting goods. In its open position, it is patented and amazing sleep space with 135 comfortable cubic feet for 2-3 adult adventures. Now there is no need to deal with hassles and sleeping on the ground, all you have just open the door and your have anywhere hotel room. It is designed with ease of use in mind at the time of travelling to our destination. It is a secure storage box and when we arrive at our destination, there are only a few steps which are required to get sleepy ready. We can use the lift system so that the adjustable legs can be folded out and locked in place. Now there are ELK emergency lifting cushions which are providing safe and dignified lift in order to reduce the risk of injury to carers. It is the perfect solution for helping those individuals who have fallen whether starting from the sitting or lying position. It is available in 56 * 57 * 51 m and can be inflated in just few seconds. Its weight capacity is 445 kg along with a reasonable price of 1600 USD. It can be efficiently used in both homes and assisted living facilities. It is being used by many ambulance services, hospitals, telecare response teams and care homes across the world. Through this system, the fallen person can be quickly and safely lifted from the floor and reduces the risk of injury to both the carer and individual. 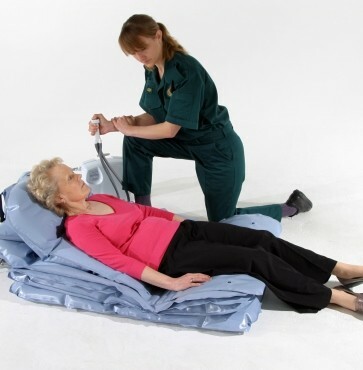 It is ideal for anyone who has fallen in a confined space as the person can be shuffled onto the cushion or rolled on from the recovery position and then assisted to sit upright. Through touching a button, it can be inflated and allows the person to settle in a raised seated position ready to stand within minutes. This technology is useful for those people who are suffering with neurological disorders and many physical disabilities such as limited mobility or amputees. The plus size or bariatric persons are also getting benefits from this technology as they face mobility changes and often find difficulties in getting back on their feet when they fall. The ELK is particularly compact and lightweight and available in size that fits all and most fragile persons up to plus size individuals. Due to its unique design, it can be used inside or outside. GoBoat is a type of a watercraft which is able to pack in the trunk of car and works well as well as let us go with fishing all by our self without any kind of deep troubles. It weighs only 15lbs and it can be assembled in few minutes along with the different parts simply snapping together. It adapts equally well for the fishing and any number of recreational water activities due to its durable and rugged plastic body. There is the necessity of a pump in order to inflate the bladder hand pump along with the bit of the elbow grease for dropping the transom mounted trolling motor in once it is set up. It can accommodate a person weighing as much as 136 kg and inflation of the tube flotation device component which is assisted with the Bellows air foot pump. In addition to this, it features a quick fill boston air valve for the convenience. It has the simple and straightforward design through which it has the strong performance in the water. It is like the boon for the fishers. 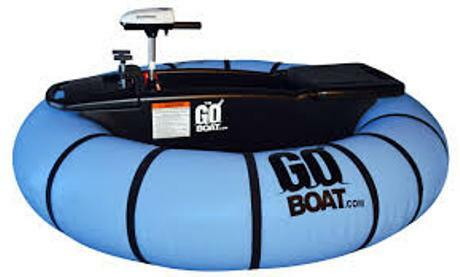 GoBoat is the portable boat which can be fitted in the car. It possesses the innovative and patented design which is light weight, durable and super portable. It is significant due to its less weight and can be carried anywhere in our car etc. Its installation is as easy as it is simple to assemble and can be set up in minutes. We do not need to the hassle with the boat landings. It is launchable from the shore, dock or beach. The Smart wardrobe: people nowadays like to shop as per the fashion, as soon as new trend get into the market they just rush to make it a part of their wardrobe, but the most important factor they forget is their wardrobe is not capable of managing them so to overcome this problem, technology introduced the smart wardrobe. This smart wardrobe will arrange and manage your clothes properly. You can access your wardrobe with the help of your phone, it will iron your clothes automatically and it even tells you that which cloth has the highest frequency of wearing and which is never touch for a long time. Avivi Kitchen: people today try to make their house look beautiful with a good centre of attraction so, just to fulfil their need technology introduced avivi kitchen or you can say smart kitchen with efficient features. It was founded by Yair Alony and Meny Hilsenrad in 2005. The main goal of this kitchen is to meet all the lacking demands of people from their normal kitchen. It works as a folded kitchen when not in use, it can be folded and it would not look like a kitchen. 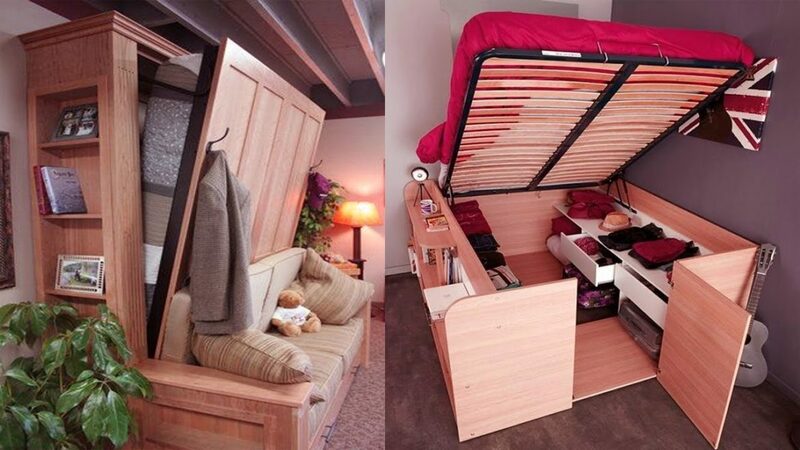 Secret Table: secret table is a kind of hidden table that is it is used to save the space in your house. This kind of table will be settled underground with its automatic feature and will come up when it is required. This feature of the table makes it attractive and more demanding.